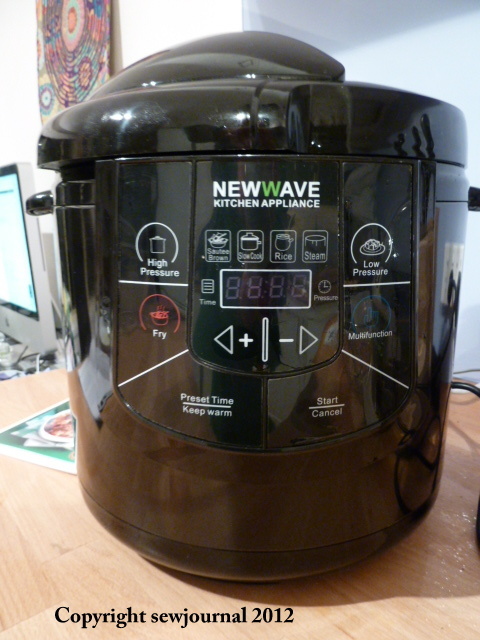 I recently splashed out and bought a 6-in-1 low/high pressure cooker/rice cooker/deep fryer/ fryer/steamer because my rice cooker died. I have never ever used a pressure cooker till I got this and I was pretty scared but I have to say it’s fun and better still it works! 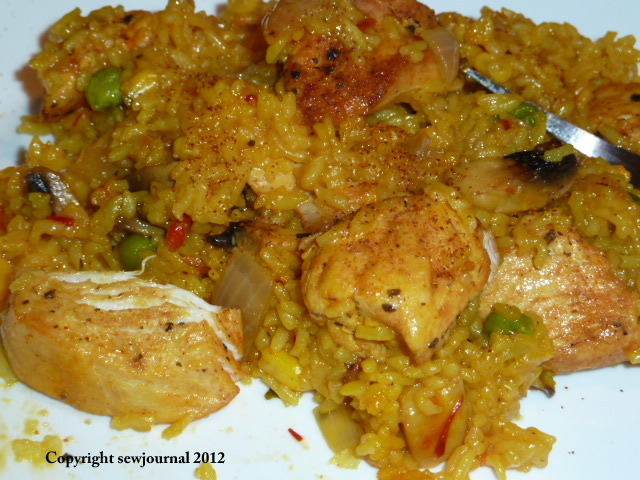 Tonight I cooked a spicy chicken and saffron risotto and it tastes spectacular! I’m so pleased with it. Here’s my recipe if you’re interested. I’ve just written what I did but you could cook this on a stove top if you had a normal pressure cooker. Warm the milk in the microwave and then add the saffron threads and leave to steep. Wash and wipe the chicken then chop into chunks and coat in the Cajun Seasoning Mix. Chop the onion and mushrooms. Press the fry button and add the olive oil. When it’s hot add the chicken and brown off. When the chicken is brown take it out and set aside. Add the onions to the oil and cook for 2 minutes then add the mushrooms and cook for a further 2 minutes. Add the margarine and when melted add the washed and drained rice and stir until it is well coated. Add the garlic and chilli and stir well. Add the saffron and mix and stir well. Cook for 1 minute then press cancel to switch off the fry function. Add the chicken stock and the frozen veges. Stir well and then add the chicken and stir again. Close the lid and set the valve to sealed. Press the high pressure function and reduce the cooking time from the 25 minutes shown to 7 minutes and press start. When it beeps, carefully release the pressure valve, taking care not to get scalded, and switch off. Once the cooker has vented open the lid, stir the contents and serve. I sprinkled a little cayenne pepper on top and it was yummy. Love your term “splashed out” – I will have to remember that one. Thanks for sharing your recipe but I was wondering if there is any alternative to the use of saffron in the recipe. Saffron is a very expensive spice and the last time I bought saffron it cost something like $8 for a few threads. A heaped teaspoon would cost something like $40 if not more which would make the recipe prohibitvely expensive. I think too that the saffron threads have to be soaked in water too in order to release their flavour but I could be wrong there. I shall try the recipe without the saffron as even without it the flavours sound delicious. Thaks again for sharing. Your new cooker might have been a bit expensive but given all the things that it can do it sounds like a good investment. Saffron is what really made it taste yummy. I was fortunate in that a friend gave me some. I think it is probably better to buy it from a Persian or middle eastern shop than the supermarket where it is very expensive. Even so a heaped teaspoon of Masterfoods saffron is still only about $5 not the $40 you quoted. The teaspoon is not compacted saffron so it’s probably not quite as much as you imagined. The cooker wasn’t too expensive as DJ’s had 15% off. The last time I bought saffron from IGA (I was lucky it had some as some supermarkets do only stock the fake stuff) it was $8 for about 7 strands, sorry to say. I did hesitate to buy it but then the recipe I was using said to use a pinch so that sufficed. I had never thought to try a middle eastern shop, not that I have seen any on the Sunshine Coast where I live – we don’t even have Greek delis up here but we do have Asian stores so perhaps I could check in one of those shops . But I shall check next time I am down in Brisbane, an hour and a bit south of here. I do agree with you re the taste of saffron – it is yum. Actually I was reading the other day about an Australian company that has starting producing saffron – perhaps up on the Atherton Tableland and they are doing very well. I now must have a good search for middle eastern shops and find some cheaper saffron as I would so love to use more of it in cooking. Your recipe looks delicious. I was stunned when Alton Brown talked about saffron. Not all saffrons are equal some contain a ton of miscelaneous junk & how to check that you’re not getting ripped off. No doubt the video is on YouTube. You don’t always get what you pay for–not a news flash but still. Thanks Doris. My saffron was a gift from a Persian friend and the fragrance was evident even through the sealed package. My cupboard smells wonderful.